This blog is lucky to have such astute readers. 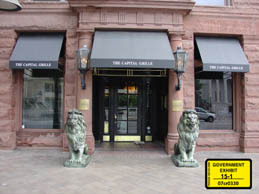 The dinner for four at the Capital Grille that Oskar is referring to took place on Monday, May 16, 2005. Foggo, then the CIA’s executive director, and his old friend, defense contractor Brent Wilkes, had two impressive guests. The government’s appendix states: “Assumes DeLay and Lewis also dined on the bill,” which came to $1,423. Wilkes, as always, picked up the tab. Fast-forward to today. Wilkes has been sentenced to 12 years prison for bribing former Rep. Randy “Duke” Cunningham with cash and hookers. (He’s out on appeal) Foggo was sentenced to more than three years for illegally steering CIA contracts to Wilkes. At the time, Reps. Jerry Lewis and Tom DeLay were two of the most powerful members of the House of Representatives. Lewis was chairman of the House Appropriations Committee and the House was set to take up its annual appropriations bills. DeLay, of course, was the majority leader. Ever since they went on a scuba-diving trip together in 1993, he said, Mr. Lewis had referred to him as his “diving buddy.” They occasionally dined together or met at political functions, Mr. Wilkes said. At a Las Vegas fund-raiser in April 2005, Mr. Wilkes said, Mr. Lewis greeted him as “Brento” and hugged him as Mr. Wilkes surprised the lawmaker with $25,000 in campaign contributions. Wilkes and Foggo were regulars at the Capital Grille and shared a well-stocked wine locker there. In 2005, documents show the two old high school buddies dined together at the pricey D.C. steakhouse about once a month. Buffett on derivatives: "it's not just whom you sleep with…"